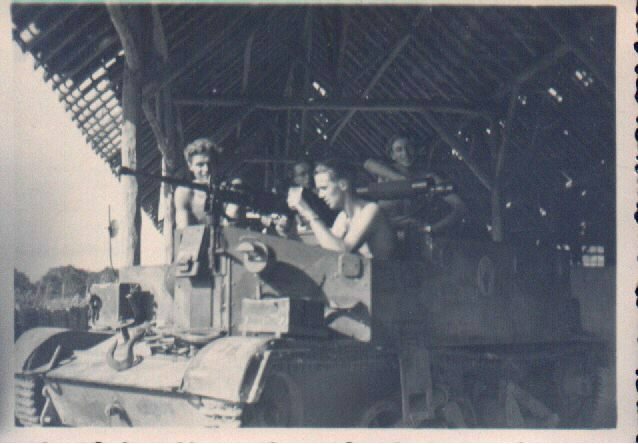 Mr. Van Roomen did not know my daddy, he went to Indonesia, Dutch East Indies in 1947 in the 2n platoon, 2nd regiment, 2nd battalion and stayed until 1950 in the eastern area of Java but he faced the same trials that my daddy did - snipers, landmines, malaria etc. as a brengun carrier driver. He shared with me some of his memories from that time, showed me his album and was wonderful enough to give me the three photographs on this page. Because of him I now really understand how dangerous my daddy's job was. 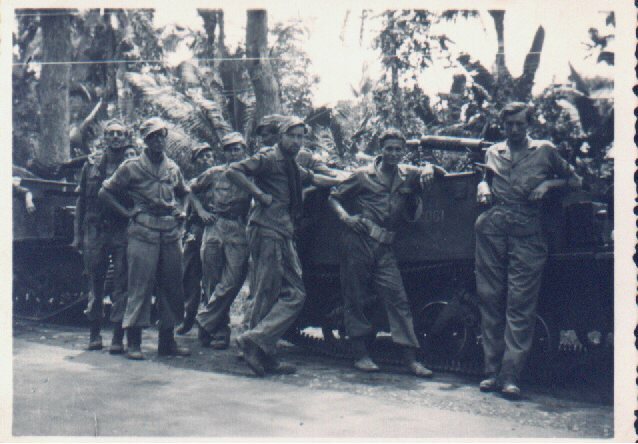 Brengun carrier drivers had to always be on the alert the guerillas set many traps for them. One of their favourites was a tank trap - they would dig a large square pit in the ground, put metals beams at the bottom of it and wait for the brengun carrier to drive into it and get stuck. The funny thing was although they were called tank traps to a tank the hole was a little bump in the road but it was disabling to the brengun carrier. Another often used trap was to put a baracade across the road, one large enough that it would take too long to move, making sure there was only one side that a brengun carrier could fit through to go around it and place a landmine there. Most of the time they carriers made it through safely, but not always. It also didn't take long for the brengun carrier drivers to attach a tall vertical medal post right in the center of the front bumper, it was do that or be decapitated by the wires struck between trees just at the same height as the drivers throat. Brengun carriers usually didn't carry brenguns, they carried any suitable gun they could find mostly a water-cooled Vicker's machine gun that could fire 600 rounds a minute. In the photo below Mr. van Roomen, left, had found a gun in a downed Japanese aircraft that was not only workable but had several hundred rounds of amunition with it. 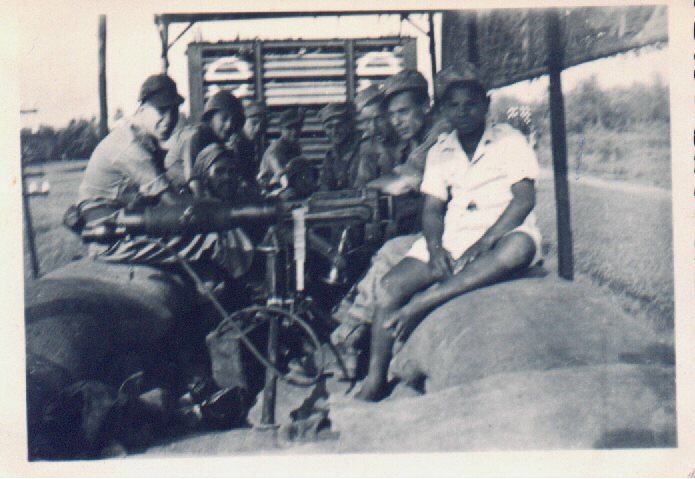 It was promptly mounted on the carrier, and his commander, sitting at the gun, was very happy about it, but The one draw back was that this time of gun needed to be cooled constantly and since a brengun carrier didn't have a cooling system on it the gun would become to hot to use after just 5 or 6 rounds. The gun pointing to the right is a Vicker's machine gun. In both the photographs above Mr. van Roomen is second soldier from the right. In the right hand photo he is on a train which they would use to go back and forth to make sure there were no bombs on the tracks, boobytraps, or unusuable. They are carrying a Vicker's machine gun, the tank on the bottom was filled with water which was sent to the gun through the hose to keep it cool.